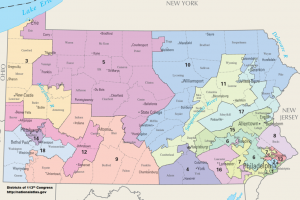 Over the past five election cycles, this column has ranked the most vulnerable seats in the Pennsylvania congressional delegation. It’s been a couple cycles since we’ve seen as many potentially competitive races as we do this year. At this stage in the 2014 and 2016 election cycles, we only rated two seats as being at least a bit vulnerable to a takeover by the opposite party. This year, we see five seats that could be vulnerable. That’s not as lengthy as our lists in 2010 and 2012 — where 10 to 12 seats were in danger of being lost — it’s a step up. A big reason for the increase in vulnerability is the growing likelihood of a strong Democratic showing. Parties that have just lost the White House typically win back seats in the next midterm election, and the historically low approval ratings for President Donald Trump suggest that 2018 could be a Democratic wave election. This has heightened the vulnerability for several incumbents. In the meantime, the shift toward Trump in demographically favorable districts had endangered one Democratic-held seat that had not been at risk in recent cycles. The districts below are ranked in descending order from most vulnerable to less vulnerable. We only consider seats that are vulnerable to a party switch in the general election, not to losses by an incumbent to a primary rival. We have sorted the districts into three categories — “vulnerable,” “potentially vulnerable” and “minimally vulnerable.” The seats in the delegation not listed below are not considered vulnerable at this time. For each district, we’ve included data for past presidential election results, median income, and college-level attainment. The data is drawn from the forthcoming Almanac of American Politics 2018, of which the author of this article is a senior author. This district, encompassing a portion of the Philadelphia suburbs and Reading, has been hotly contested territory for more than a decade, first when it was held by Republican Rep. Jim Gerlach and then under Costello, who succeeded Gerlach in 2014. Costello defeated Democrat Mike Parrish in 2016, 57 percent-43 percent, but no one expects the margin to be that wide again in 2018. Democrats are touting the leading challenger, Chrissy Houlahan, as one of their best recruits in the nation. Educated at Stanford and MIT, Houlahan served in the Air Force and has worked both in the apparel business and in the non-profit world. Houlahan raised $432,000 in the second quarter and has $383,000 in cash on hand. Her haul was about half the size of Costello’s but it’s a decent head start for a challenger. Both national parties are focusing intensely on this race, and there’s wide agreement that, for now at least, the 6th is the most aggressively contested congressional district in the state. Meehan’s Delaware County-based district has been on the fringe of competitiveness in recent cycles, but it never flipped control, partly because Meehan — first elected in 2010 — was considered a solid lawmaker. But the strong pro-Hillary Clinton tide in the Philadelphia suburbs has lured a large field of Democratic challengers this year, including state Sen. Daylin Leach, Andrew McGinty, Elizabeth Moro, Dan Muroff, Paul Perry, and Molly Sheehan. Leach is arguably the best known candidate; he also has a strong base in the party’s progressive wing and may be able to raise significant funds over the Internet from a national audience. But he won’t necessarily win by acclamation: Muroff and Sheehan reported six-figure fundraising hauls in the second quarter. Meehan has $2.3 million in the bank and starts as the favorite. Still, it could be his toughest contest in years. Fitzpatrick, who succeeded his brother Mike Fitzpatrick with an eight-point victory in 2016, represents a highly competitive, Bucks County-based district. On paper, the district could easily rank first or second on our vulnerability list but for one key factor: There is no Democratic challenger, at least so far. Democratic officials expect to have one before long. But for now, Fitzpatrick’s seat rates as less vulnerable than either Costello’s or Meehan’s. Smucker won the Lancaster County-based seat in 2016, succeeding long-serving GOP Rep. Joe Pitts. Historically, the district has been solidly Republican, but the partisan balance has shifted in recent years as the area has grown more suburban. Democrat Christina Hartman, who lost to Smucker by 11 points in 2016, is preparing for a rematch and is the frontrunner in a Democratic primary that also includes pharmacist Charles Klein and former superintendent John George. Smucker has only $181,000 in cash on hand — less than other vulnerable incumbents in the delegation– but Democrats probably have to hope for a strong wave if they are to flip Smucker’s seat. At the moment, Cartwright — who represents a sprawling district that encompasses parts of Wilkes-Barre, Scranton and Easton — is the only House Democrat in Pennsylvania who looks vulnerable in 2018. He hasn’t been seriously challenged since he defeated conservative Democrat Tim Holden in the 2012 primary and prevailed in the general election. Last year, he won 54 percent of the vote — down from 57 percent in 2014 and 60 percent in 2012. Then Trump happened: The margin in the presidential race in the 17th District shifted from a 12-point Obama win to a 10-point Trump victory. Republican John Chrin is challenging Cartwright. He’s from Easton but worked out of state in the financial industry, including a stint as a managing director at J.P. Morgan Chase, enabling him to spend some of his own money on the race. He trails Cartwright in money but has more than $350,000 in the bank. While any Republican can expect headwinds in the 2018 midterm, Chrin has a shot at making this district competitive. Democrats have long eyed Dent’s Lehigh Valley seat, and periodically cast an eye toward Murphy’s southwestern Pennsylvania district. Murphy even has a Democratic challenger with political experience — former Allegheny County councilman and Mt. Lebanon commissioner Mike Crossey. But both Dent and Murphy are experienced incumbents with substantial war chests, and neither party is viewing these districts as ones with a high likelihood of switching. Even a Democratic wave looks unlikely to flip the seats. Within hours of this appearing, almost 200 people hit “like”; it seems Brother Brian will be primaried. Not even a working link you idiot. No, doctor. You are the idiot. Just think how vulnerable these seats would be if they were not all illegally gerrymandered. I hope new boundaries are mandated by the courts. A quick look at this map and you see animals crawling on the screen. Disgusting and illegal. Un-democratic and un-American. The metaphor is amusing, but one must also take into account geography [mountains]. Ahh Yes, the great mountain ranges of Southeastern Pennsylvania account for gerrymandering! Just what would those mountains be called? I propose we call them “The Horseshit that came out of Robert B Sklaroff, MD’s mouth”. Doesn’t really flow off the tongue. What would be some better names? Can tell you’re a democrat lol. If the Dems held the pen and had these districts carved out, I’m sure you would be singing a different song. The true ugliness comes from hypocrites like yourself. Other Guy, you must be a mind-reader. (Just kidding.) Please don’t paint everyone with the same brush. Just a weak justification on your part for an unfair, undemocratic process. As a lifelong Democrat, all I’d like to see is a fair system, developed by an impartial citizen commission. Let the best candidates/policy ideas win, fair and square. You do realize to make some of these districts 50/50 registration wise you’d have to dip into parts of Philly, etc. The team that holds the pen draws the lines. Thats how it always was. Funny that you didn’t make these same comments when Matt Cartwright’s District was created. There is nothing illegal about gerrymandering unless and until the US Supreme Court says so. It appears to be ok when the Democrats do it as they have in Illinois and Maryland but awful when the Republicans do it as in PA and NC. The problem has much more to do with the fact that so many Democrats are packed into the big cities leaving the suburban areas the only real competitive seats in the country. This is not a problem that can be solved by the US Supreme Court. 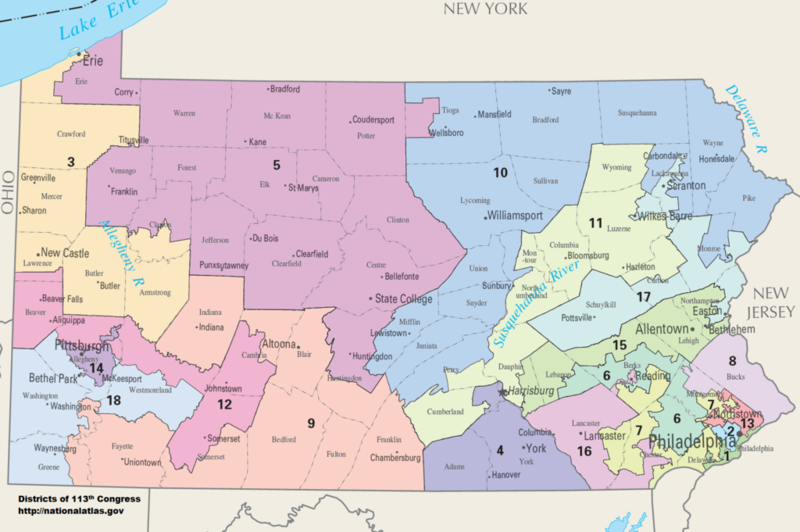 The City of Reading is in the 16th, not the 6th, Congressional District of Pennsylvania. That population, overwhelmingly Democratic, could have a significant impact on the outcome of the 16th District race in 2018. Maybe you need to recalculate as you note that in the Costello race.